“My dear woman, how can you?” said the Queen: and she told her, “The King and I have no children: that’s why I am so distressed.” “Well, you needn’t be,” said the old witch. “I can set that right in a twinkling, if only you will do exactly as I tell you. Listen. To-night, at sunset, take a little drinking-cup with two ears” (that is, handles), “and put it bottom upwards on the ground in the north-west corner of your garden. Then go and lift it up to-morrow morning at sunrise, and you will find two roses underneath it, one red and one white. If you eat the red rose, a little boy will be born to you: if you eat the white rose, a little girl will be sent. But, whatever you do, you mustn’t eat both the roses, or you’ll be sorry,—that I warn you! Only one: remember that!” “Thank you a thousand times,” said the Queen, “this is good news indeed!” And she wanted to give the old woman her gold ring; but the old woman wouldn’t take it. However, at last she decided on the white rose, and she ate it. And it tasted so sweet, that she took and ate the red one too: without ever remembering the old woman’s solemn warning. Some time after this, the King went away to the wars: and while he was still away, the Queen became the mother of twins. One was a lovely baby-boy, and the other was a Lindworm, or Serpent. She was terribly frightened when she saw the Lindworm, but he wriggled away out of the room, and nobody seemed to have seen him but herself: so that she thought it must have been a dream. The baby Prince was so beautiful and so healthy, the Queen was full of joy: and likewise, as you may suppose, was the King when he came home and found his son and heir. Not a word was said by anyone about the Lindworm: only the Queen thought about it now and then. Then the Prince made the coach turn round and try another road: but it was all no use. For, at the first cross-ways, there lay the Lindworm again, crying out, “A bride for me before a bride for you!” So the Prince had to turn back home again to the Castle, and give up his visits to the foreign kingdoms. And his mother, the Queen, had to confess that what the Lindworm said was true. For he was really the eldest of her twins: and so he ought to have a wedding first. There seemed nothing for it but to find a bride for the Lindworm, if his younger brother, the Prince, were to be married at all. So the King wrote to a distant country, and asked for a Princess to marry his son (but, of course, he didn’t say which son), and presently a Princess arrived. But she wasn’t allowed to see her bridegroom until he stood by her side in the great hall and was married to her, and then, of course, it was too late for her to say she wouldn’t have him. But next morning the Princess had disappeared. The Lindworm lay sleeping all alone: and it was quite plain that he had eaten her. So the carriage tried another road, and the same thing happened, and they had to turn back again this time, just as formerly. And the King wrote to several foreign countries, to know if anyone would marry his son. At last another Princess arrived, this time from a very far distant land. And, of course, she was not allowed to see her future husband before the wedding took place,—and then, lo and behold! it was the Lindworm who stood at her side. And next morning the Princess had disappeared: and the Lindworm lay sleeping all alone; and it was quite clear that he had eaten her. But the King wouldn’t take “No” for an answer: and at last the old man had to give in. “Well, you needn’t be,” said the witch-woman. “All that can be set right in a twinkling: if only you will do exactly as I tell you.” So the girl said she would. “The last is the worst notion—ugh!” said the shepherd’s daughter, and she shuddered at the thought of holding the cold, slimy, scaly Lindworm. “Do just as I have said, and all will go well,” said the old woman. Then she disappeared again in the oak-tree. 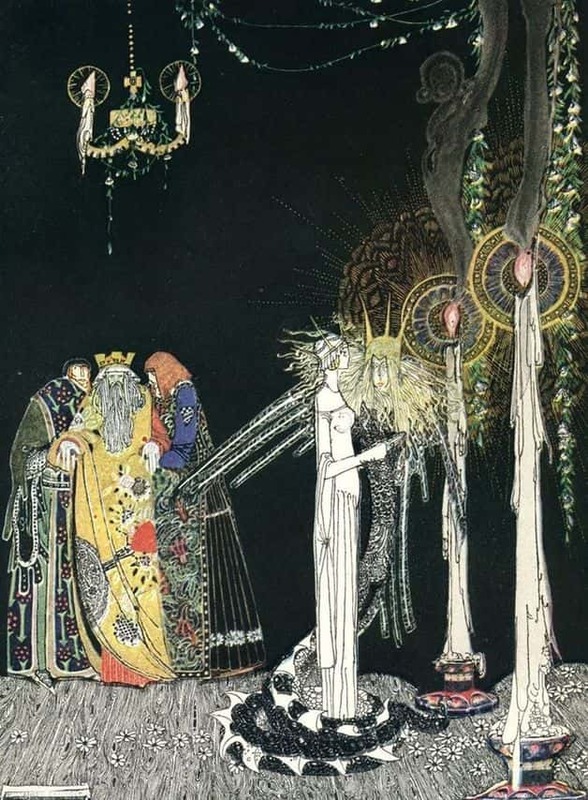 “She saw the Lindworm for the first time as he came in and stood by her side.” Illustration by Kay Nielsen, published in East of the Sun and West of the Moon: Old Tales from the North by Peter Christen Asbjørnsen and Jørgen Engebretsen Moe (1914), George H. Doran Company. When the wedding-day arrived, the girl was fetched in the Royal chariot with the six white horses, and taken to the castle to be decked as a bride. And she asked for ten snow-white shifts to be brought her, and the tub of lye, and the tub of milk, and as many whips as a boy could carry in his arms. The ladies and courtiers in the castle thought, of course, that this was some bit of peasant superstition, all rubbish and nonsense. But the King said, “Let her have whatever she asks for.” She was then arrayed in the most wonderful robes, and looked the loveliest of brides. She was led to the hall where the wedding ceremony was to take place, and she saw the Lindworm for the first time as he came in and stood by her side. So they were married, and a great wedding-feast was held, a banquet fit for the son of a king. When the feast was over, the bridegroom and bride were conducted to their apartment, with music, and torches, and a great procession. As soon as the door was shut, the Lindworm turned to her and said, “Fair maiden, shed a shift!” The shepherd’s daughter answered him, “Prince Lindworm, slough a skin!”—“No one has ever dared tell me to do that before!” said he.—“But I command you to do it now!” said she. Then he began to moan and wriggle: and in a few minutes a long snake-skin lay upon the floor beside him. The girl drew off her first shift, and spread it on top of the skin. “No one has ever dared tell me to do that before,” said he.—“But I command you to do it now,” said she. Then with groans and moans he cast off the second skin: and she covered it with her second shift. The Lindworm said for the third time, “Fair maiden, shed a shift.” The shepherd’s daughter answered him again, “Prince Lindworm, slough a skin.”—“No one has ever dared tell me to do that before,” said he, and his little eyes rolled furiously. But the girl was not afraid, and once more she commanded him to do as she bade. And so this went on until nine Lindworm skins were lying on the floor, each of them covered with a snow-white shift. And there was nothing left of the Lindworm but a huge thick mass, most horrible to see. Then the girl seized the whips, dipped them in the lye, and whipped him as hard as ever she could. Next, she bathed him all over in the fresh milk. Lastly, she dragged him on to the bed and put her arms round him. And she fell fast asleep that very moment. Next morning very early, the King and the courtiers came and peeped in through the keyhole. They wanted to know what had become of the girl, but none of them dared enter the room. However, in the end, growing bolder, they opened the door a tiny bit. And there they saw the girl, all fresh and rosy, and beside her lay—no Lindworm, but the handsomest prince that any one could wish to see. The King ran out and fetched the Queen: and after that, there were such rejoicings in the castle as never were known before or since. The wedding took place all over again, much finer than the first, with festivals and banquets and merrymakings for days and weeks. No bride was ever so beloved by a King and Queen as this peasant maid from the shepherd’s cottage. There was no end to their love and their kindness towards her: because, by her sense and her calmness and her courage, she had saved their son, Prince Lindworm.